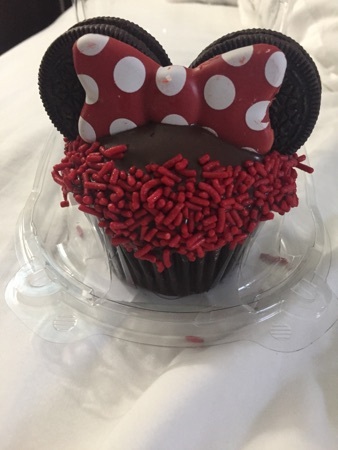 This mornings breakfast was another Minnie Mouse cupcake. DD and DH had cereal and DH and I had a coffee. 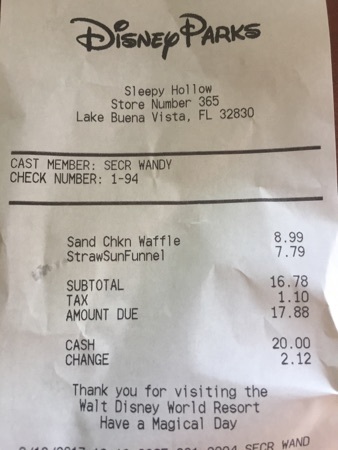 We spent the day in magic kingdom, after 7dmt and splash mountain we stopped by sleepy hollow to get some lunch. 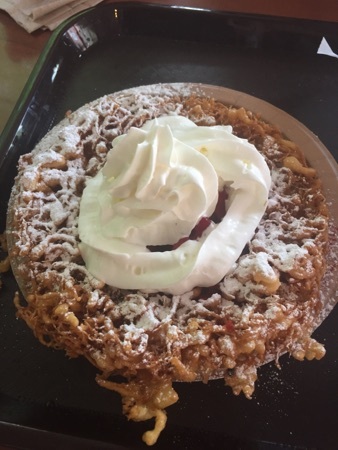 DH had a funnel cake with strawberries and squirty cream. He really enjoyed this, it's kinda like a crispy flat donut. 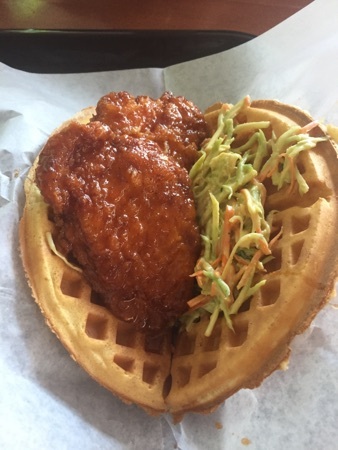 I had sweet and spicy chicken on a waffle, this was served with coleslaw. It was really good the chicken tasted abit like sweet and sour but with abit more of a kick. I really enjoyed this. DD shared abit of each. This came to $17.88 and we were all full afterwards so was a pretty good lunch. Mid afternoon DD asked if she could have a snack, we were in the big top sheltering from the rain so let her choose whatever she would like from the counter in the centre. She went for the speciality Minnie Mouse apple. 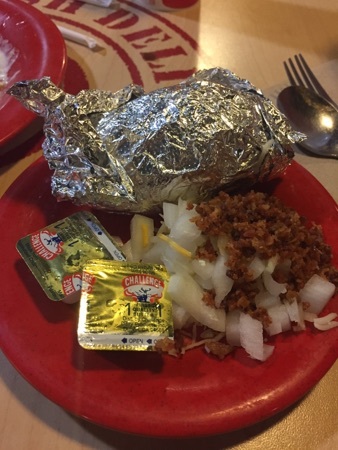 The cut it up for us to make it easier to eat. 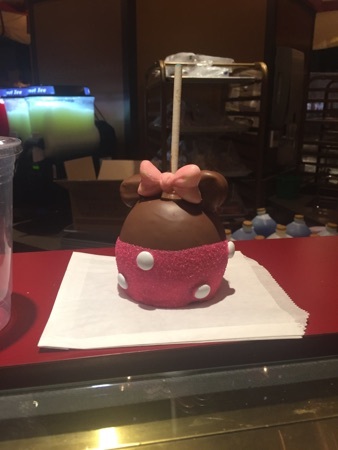 The apple was covered in caramel and chocolate and dipped in sugar sprinkles with white smarties stuck on as decoration and the ears were marshmallows covered in chocolate and the bow was Chocolate. DH and I helped DD finish this, it was pretty good but very expensive at $10.99! We left a very wet magic kingdom and stopped off at our hotel to get changed before heading to sweet tomatoes for some dinner. We went to the one down by rolling oaks. 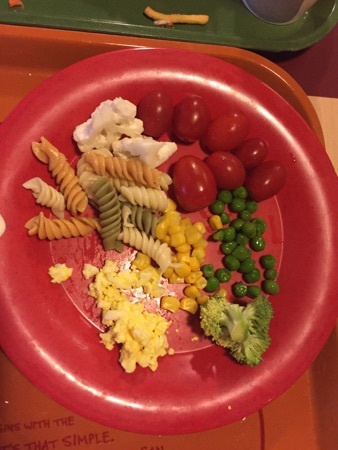 DD got some pasta, tomatoes, peas, sweet corn, broccoli, egg and cauliflower. 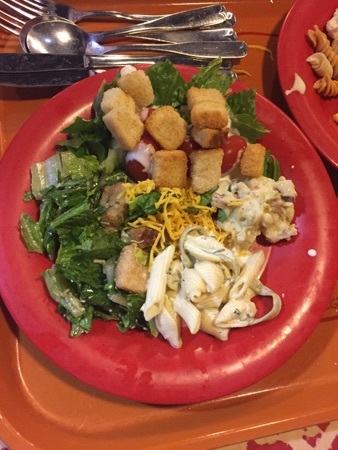 This was DH's plate from the salad bar. 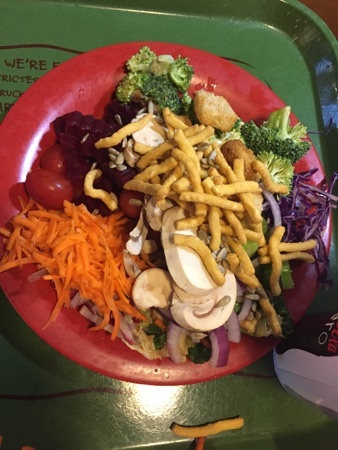 There is loads of selection of salads, pasta salads and bits to make your own salad. This was my plate of salad, the Caesar salad was really good! 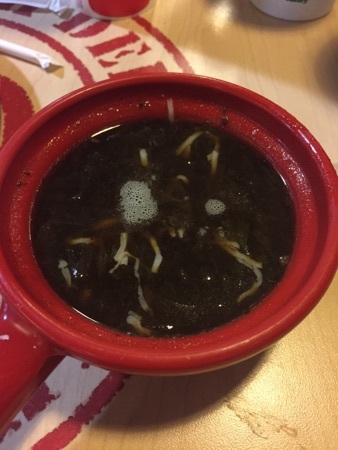 We then each got a bowl of French onion soup. I put some grated cheese in mine. It was absolutely gorgeous! It was really rich with loads of flavour and plenty of onion. I also had a jacket potato with grated cheese, onion and bacon bits to top it with, this was really good. My only criticism is I generally like my potatoes a little bit more cooked. And finally dessert! 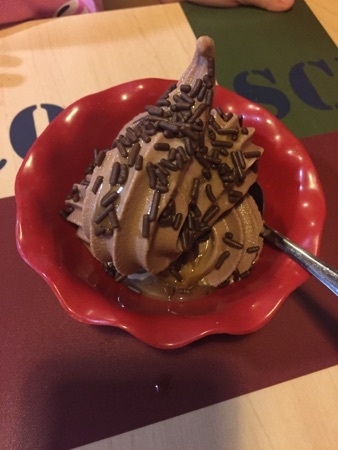 We all got ice cream and sauce. They have some brownie bites and tapioca and chocolate mousse too. This came to $37 for 2 adults and one child for the buffet and a drink each. They do the most amazing strawberry lemonade here so we all had one of those to drink. New Photo Added by missdopey - 13 Aug 17 1:49 PM. The chicken waffle looks really good. I always eye up the covered apples but have never got one yet, although the fact that they will slice it up for eating is good to know.